Lady & the Pit,2220 Handley Dr, FW. 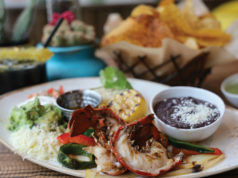 682-301-1888.11am-4pm Sun, closed Mon-Tue, 11am-8pm Wed-Sat. All major credit cards accepted. Natasha Smith, the lady behind Lady & the Pit, says she saw potential in the unprepossessing white brick building at the intersection of Handley and Meadowbrook drives long before she developed the recipe for her sweet, molasses-kissed barbecue sauce. The building formerly housed a series of pizzerias in a neighborhood that’s short on homemade food that isn’t deep-fried and served in Styrofoam containers. With the help of pitmaster Kenneth Barton, Smith perfected her recipes on the Texas Gulf Coast, and the pair has been dishing out equal helpings of smoked meats and love in the Fort for several years. 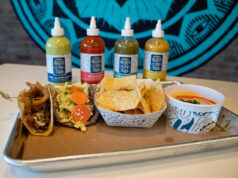 Recently, Smith added a healthier twist to the menu, incorporating a handful of vegetarian dishes that are Blue Zones-friendly – a feat that few mom-and-pop joints in Handley are attempting at the moment. The simplest way to judge a barbecue place is by the brisket. Lady & the Pit’s meat had the telltale red smoke ring and a savory flavor that made the thick, syrupy sauce superfluous. One of the end pieces was a little dry, but the crust from the rub still tasted fine. The sauce took a little getting used to. The first taste overwhelmed my palate with sweetness. It took a few bites for the subtle tang to make its way to the front of my taste buds. While the parking lot smelled deliciously smoky, the restaurant didn’t, which was a definite bonus. The two-meat combo of sausage and pulled pork was a bit of pig overload, but my dining companions didn’t care. The sausage was almost buttery, and it was spicy without being overwhelming. The pulled pork was tender and a little fatty, with a glorious crust and an appreciable smoke ring. Like the brisket, neither pork option actually needed the sauce to improve the taste or texture. Lunch plates include your choice of two sides from a fairly standard soul food/barbecue selection. The coleslaw proved to be the perfect accompaniment to the sausage. The vinegary crunch of the veggies cut through the uber-rich meat. The collard greens, swimming in pot liquid and dotted with more pork, were savory and slightly bitter, which balanced the pulled pork and the sauce. While the baked beans were a step up from the Bush’s canned version, they mostly remained on the plate, as did the homemade but underwhelming, bland mac and cheese. We also tried two of the new Blue Zones menu items, and my dining companions and I were wowed by both the whole sweet potato and the sautéed zucchini, squash, and onions. The veggie mix had a hint of Italian spice. The onions were nicely caramelized, and the vibrant blend was still slightly al dente and not swamped by sauce. The potato was perfect, with cinnamon, nutmeg, and just a little drizzle of honey. No butter or marshmallows adorn the starch, and neither was needed. The dish was tasty enough to sub in as a dessert if you’re counting calories. After virtuously ordering from the healthier side of the menu, we decided to splurge on dessert. The creamy Key lime pie atop a scrumptious graham cracker crust was the ideal balance of sweet and sour. Sometimes if a pie’s made with faux lime flavor, the end result looks like antifreeze and doesn’t taste much better. The fresh shreds of lime rind on top provided an extra, genuine pop of flavor. The peach cobbler was a little too heavy and rich and might have benefitted from some vanilla ice cream. On the day we ate lunch, the restaurant was fairly empty at 11:30 a.m., so our friendly server could pay a little extra attention to our table of obvious newbies. By noon, the place was full of regulars, and the service slowed down a bit. 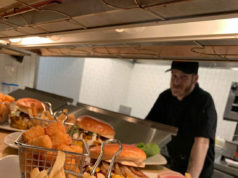 Because all of the food is made in-house, lunch is going to take a little longer than, say, a to-go meal at either the catfish joint or the burger barn up the street. But it will be time well spent. 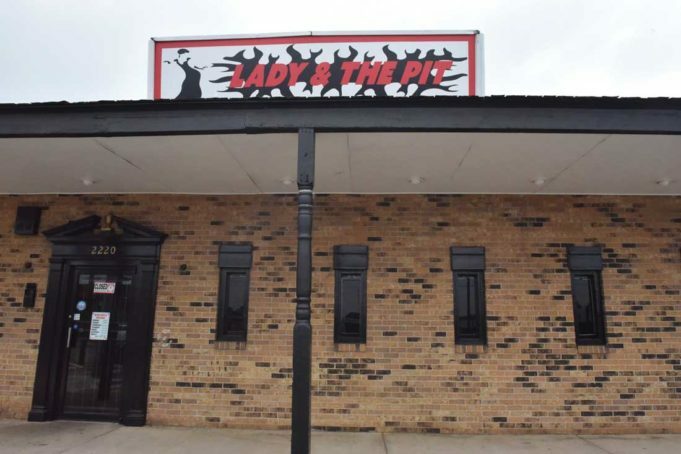 I have been to Lady and the Pit several.times and have tried something different each visit. Fried bolo, chopped, catfish, chicken fried steak, etc. I have yet to be disappointed. I hear the mesquite smoked chicken salad is off the hook good. I’m usually not a dessert person, but their peach cobbler was simply amazing. I went to lady and the pit and I was GREATLY Disappointed FIRST greens don’t need vinegar and if you say you have mac and cheese then use real cheese.. and chopped beef dose not need BBQ sauce if it’s good. So any stems in the greens I would not recommend this place.